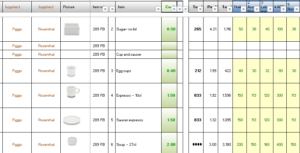 Preparation of OS&E Master lists with quantities for each new project. Lists tailored to the operator’s standards & area config. Over 4000 items of best quality products. Provides structure and control to the process at an early stage. Step 1 Preparation of scope of OS&E. I provide Client with a copy of RDunns hotel OS& E and FF&E scope document. Client to provide plans, furniture layouts and area schedules (if available). Review the above (if available) in terms of equipment needs. Review operators OS&E template lists. Prepare preliminary customised OS&E Masterlist using operators OSE template list. Add in and highlight any missing lists or items not normally OS&E. Enter operator’s item par coefficients to create quantities. Make a budget allowance where quantities or specs unknown eg buffet. Highlight in OS&E Masterlists. Step 4 Preparation of budgets.. Prepare preliminary budgets using operators budget pricing if made available. If budget pricing not available then agree strategy with Client to calculate a preliminary budget. Note If this involves requesting prices from suppliers then an additional charge may be required. Identify items that are sometimes rented/leased eg linen , vehicles, Include in budget. Identify items that are unspecifed and quantified (known unknowns) eg uniforms. Provide guidance on OS&E standards (where not provided by operator), suppliers and manufacturers . Operator to provide documents like OSE Template Operators manual, buying guides, preferred supplier list, safety standards manual and green standards which will be incorporated where necessary in Masterlists . with building eg trolleys in lifts, vacuum cleaners and flooring, safes and floor loading. Identify products for which samples are required for approval by Operator. Provide Client with details of alternative reputable suppliers which will provide qual quality and save money for owner. Client arranges samples and coordinates table top review and model room. Step 7 . Preparation of schedules(time) . Over view of time for processes (budget, bidding/tender, orders, production, shipment delivery installation). Purchase order schedule of priorities eg high value long lead time goods first. Product codes only provided if on Operators OS&E Template. For sections where products specs unknown (eg uniforms) a generic list with quantities will be provided. Generic descriptions will be provided for those items where technological advances are continual eg photocopiers. where coefficients are not yet quantifiable and will be done at tender stage eg shelving. where standards/regulations (eg fire, electrical ) may vary from country to country. where final selection will depend on other factors eg: local hotel operational needs, ID requirements , project manager’s needs, floor loading or local agent /local services.